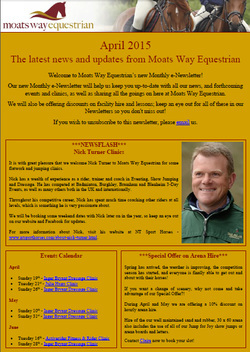 Welcome to Moats Way Equestrian’s new Monthly e-Newsletter! Our new Monthly e-Newsletter will help us keep you up-to-date with all our news, and forthcoming events and clinics, as well as sharing all the goings on here at Moats Way Equestrian. We will also be offering discounts on facility hire and lessons; keep an eye out for all of these in our Newsletters so you don't miss out! Check out April's e-Newsletter here!